Last year around this time I pulled something in my back. Technically, it was a herniated disc, which then pinched a femoral nerve down the front of my leg. Normally I wouldn’t know such anotomical terms except it hurt so much I broke down and went to a doctor. What a drag. I’ve gotta admit I’m a wimp for anything medical. Determined that this should never happen again, I got right on the ball with preventative measures (yes, pun intended, as my photo above shows). My goal: better posture, more exercise and strengthening my back (I do believe they refer to this whole area as core strength, of which, after four kids and too much desk-time, I have none). 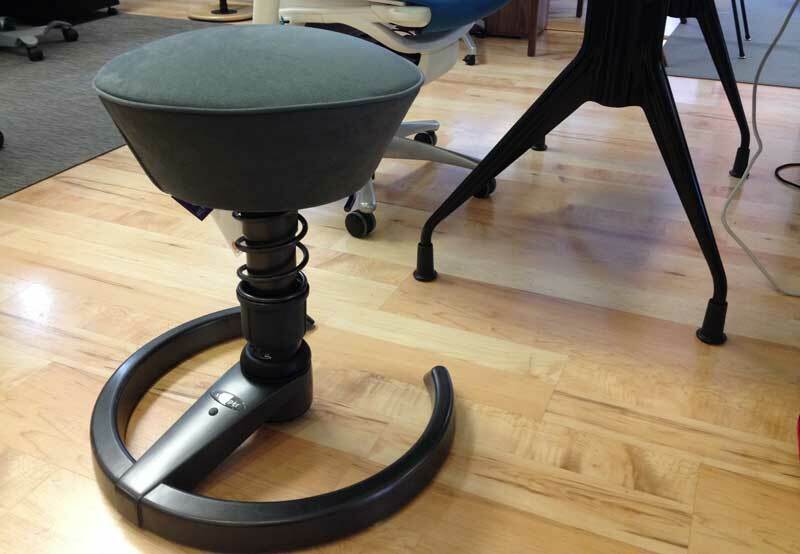 I also started researching desk chairs. My first experiment was using my exercise ball as a desk chair. Initially it was fun. I put on some music and started jive-bouncin’ away. I was like—hey, I’m exercising my back while I’m working! I can do two things at once! Then, because coordination isn’t one of my inherent traits, I literally rolled onto the floor. When I did manage to stay upright, I noticed I was subconsciously stabilizing the ball with my feet and arching too far forward with my torso. I then researched brand names for their innovative furniture. Gaiam: Not too expensive. Swopper: More expensive. Herman Miller’s Aeron Chair: Way too expensive. The Swopper was most intriguing. I liked the idea of training muscles and my moving joints, and when I tried one at Century House I really liked it. It’s comfortable, stable and, yes, I really, really like it. But wow, $699 is a lot of money for a chair. And besides, what if sometimes I actually want to sit back and relax? The Swopper was delegated to my “maybe someday, when I have more money” list. Enter the balance disc, a.k.a sitting disc or exercise disc. 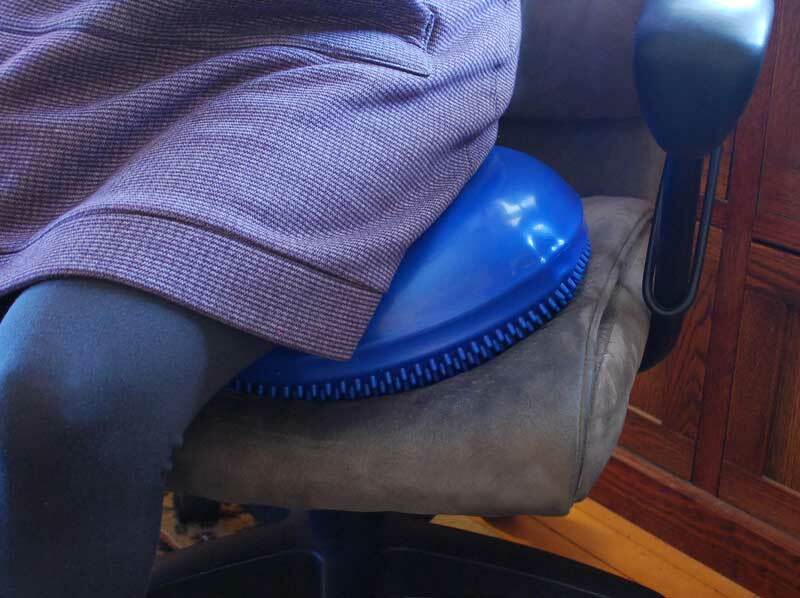 Last month, for less than $50, I bought Dynatronic’s 15″ inflatable cushion with a smooth sitting surface on one side and a textured foot massage on the other. 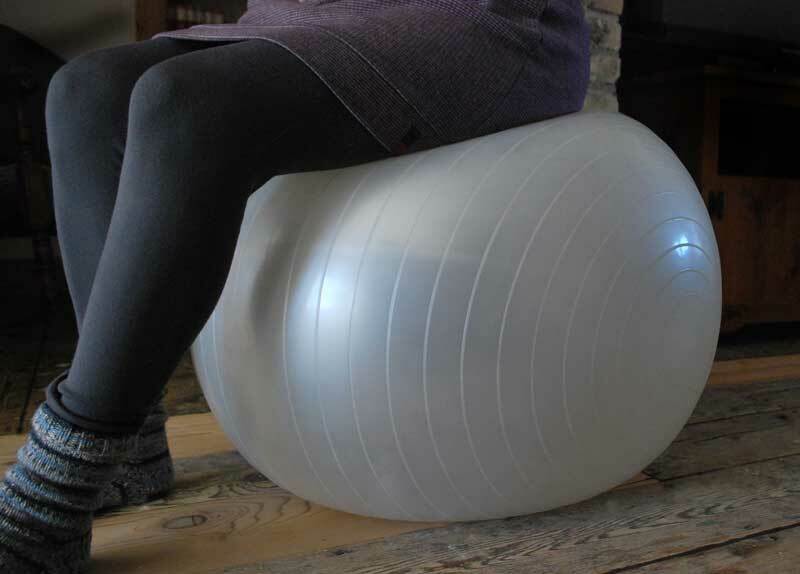 It combines the core workout of an exercise ball or Swopper with the continued use of my well-worn and comfortable chair. What’s really nice is when I need a break from such active sitting, I just throw it on the floor and work without it. Speaking of chairs, today AIGA is officially celebrating a century of design. There are exciting design events in the months ahead, including Facing Forward, an AIGA National Design Center exhibit in New York City featuring member-designed Windsor chairs. I’m looking forward to seeing them!